If you’re hosting a Super Bowl party in the comfort of your Miami home, you’ll want to take note of this pimento cheese recipe. Everyone will be glued to the TV watching the Los Angeles Rams and the New England Patriots fight it off for the big one and you’ll be in the kitchen preparing this creamy pimento cheese dip courtesy of Chef McInnis of Root & Bone (and yours truly). We stopped by chef Jeff McInnis and Janine Booth’s Miami location of their acclaimed New York City concept, Root & Bone to see if they could lend us a hand and help us create the most delicious Super Bowl snack. We were looking for something Southern with bold flavors and naturally couldn’t think of anyone better for the job. 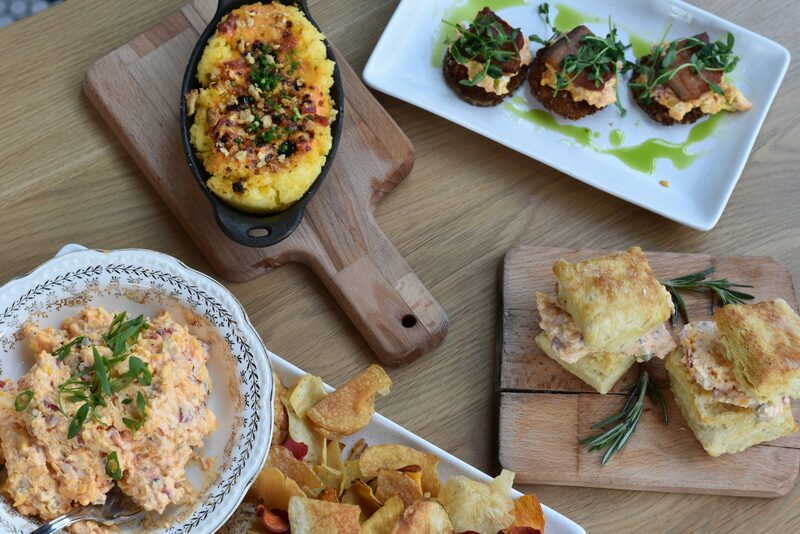 If you haven’t been to this new neighborhood gem in South Miami, you must stop by for lunch, brunch or dinner. They’re serving Southern classics with their unique twist. Menu highlights include rack of Dry Rub Brûléed Spare Ribs, Sweet Tea Brined Fried Chicken, Gooey Sweet Corn Spoon Bread, Banana Cream Pie Waffles and more. 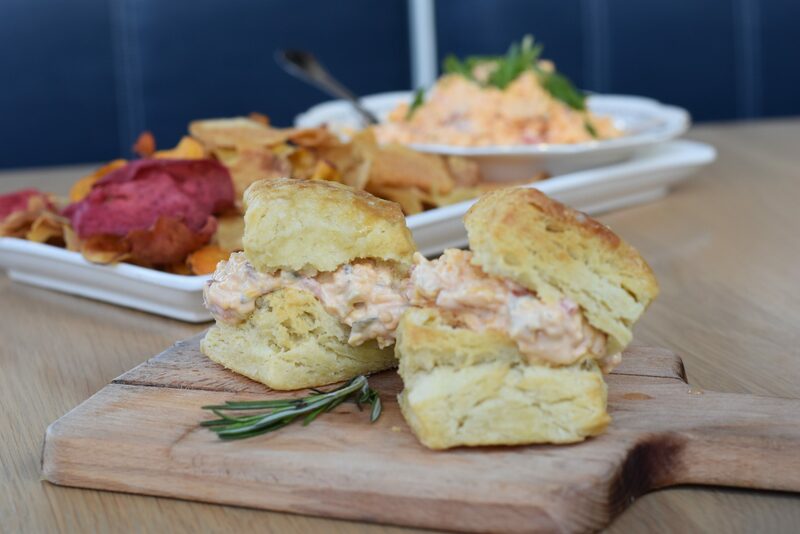 The beauty of the pimento cheese is that it can be served in many different ways. 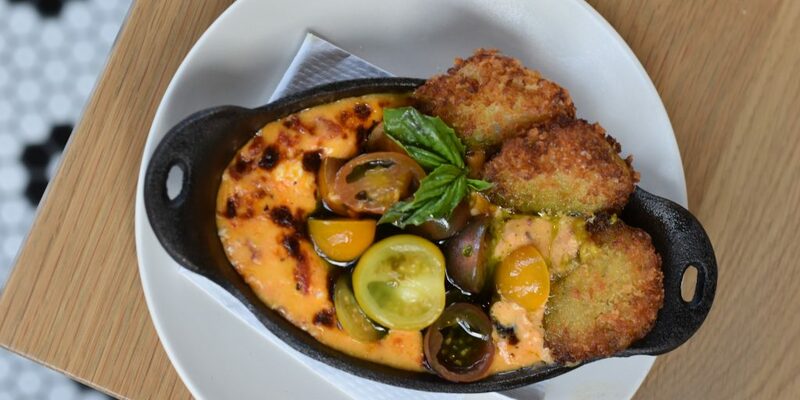 We tried it on biscuits, fried green tomatoes and grits. Here are a few different recipes that will leave you like the Super Bowl winner. Place cream cheese in an electric mixer and beat until smooth. Add all of the cheddar, mayo, bell peppers, onion, Tabasco, pickles, salt and pepper and beat until well blended. Taste for seasoning. Refrigerate until needed. Using a 2 oz. ice cream scoop, scoop cheese onto a sheet pan with parchment paper and refrigerate for 4 hours. Place egg, flour and breadcrumbs in three separate bowls. When ready to plate, bread each pimento ball starting with the flour, egg and finally bread crumbs. Using a candy thermometer, heat oil in saucepan to 350 F. Fry for 2-3 minutes until golden brown. To make salad, combine watercress, frisee, corn and tomatoes. Season with salt, pepper and drizzle with oil. Toss to combine, place on plate and top with pimento croquette. On a sheet pan, lay out slices of bread. Drizzle with oil, and season with salt and pepper. Turn bread over and spread ½ cup of pimento cheese on 4 slices. Top with tomatoes, basil and drizzle with a little olive oil. Put the blank slices on top of each. Heat a large sauté pan on medium high. Add butter and once melted place each sandwich onto the pan. Cook for 3-4 minutes until golden brown and flip each to repeat on the other side. Remove from pan, cut in half and enjoy. For a quick snack or amazing party dip take 1 -2 # of your favorite vegetables. Radishes, rainbow carrots, celery, endive, cucumbers etc and cut to crudité size. Serve with a large bowl of pimento cheese.